LAU Development Office gets Quality Management System - ISO 9001:2008 certification from the British Standards Institution. The British Standards Institution, a leading global provider of standards and management systems, recently granted LAU’s Development Office the Quality Management System - ISO 9001:2008 certification. “It took around a year, 13 training sessions and a unique team work effort to reach this prosperous and thriving result,” says Nassib Nasr, assistant vice president for development who has spearheaded this initiative. “It is never easy to tell an already overwhelmed team that new procedures are to be followed – which means extra work to be done – but once the mechanism is in place it facilitates our everyday work, makes it more efficient and effective and gives us even more credibility,” Nasr adds. To be ISO 9001-2008 certified, an organization needs to establish, document, implement and maintain a quality management system and to continually improve its effectiveness in accordance with the requirements of the certification’s international standards. In return, the organization ultimately improves its communication ability, its work consistency and efficiency, as well as it raises its customers’ satisfaction level. Tager, a senior consultant on standard based management systems recalls his time spent with the Development Office team, “we regularly met for three to four hours and I can tell you that I saw an extremely responsive and committed team,” he said. “This certification has helped us organize our work in a different way: everything we do is now transcribed into policies, procedures, key productivity indicators, charts…,” says Grace Aoun-Noujaim, executive assistant at the Development Office. Appointed ISO 9001:2008 management representative, Aoun-Noujaim has among other tasks, the mission to ensure that the processes needed for the quality management system are established, implemented and maintained. “Now that we have been granted the ISO 9001-2008, we have the mission to maintain it,” she adds. 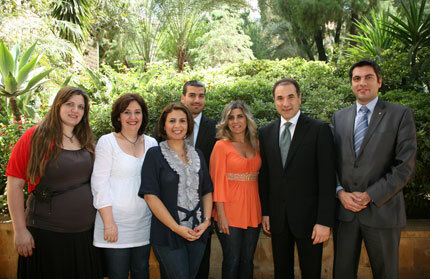 Thrilled by the announcement, LAU President Dr. Joseph G. Jabbra extended his congratulations to Nasr and his team. “This is a great achievement… You all worked very hard at it and your hard work paid off,” he said. As part of its contribution to the advancement of LAU, the Development Office works to secure the financial support for the university through donations from individuals, companies and foundations. Working with current and prospective donors, the office seeks to support scholarships, professorships, educational program development, facilities renovations and construction, research and other special initiatives of the university.